Q: There are some reports thatthe DPRK is taking advantage of loopholes in the UN sanctions to increase the export of iron ore to China. How do you comment on that? A: As neighbors, China and the DPRK maintain normal economic and trade exchanges. Resolution 2321 stipulates that sanctions shall not affect transactions in iron and iron ore that are determined to be exclusively for livelihood purposes and unrelated to generating revenue for the DPRK's nuclear or ballistic missile programs. China's stance of staying committed to denuclearization of the Korean Peninsula is firm and clear, and it will continue to implement the relevant Security Council resolutions in a comprehensive, accurate, faithful and strict manner. Q: Yesterday, the Philippine Department of Foreign Affairs issued a statement on the first anniversary of the South China Sea arbitration. There are comments that the relevant content of this statement has signaled goodwill to the Chinese side and is conducive to further development of China-Philippine relations and regional peace and stability. What's your comment on that? 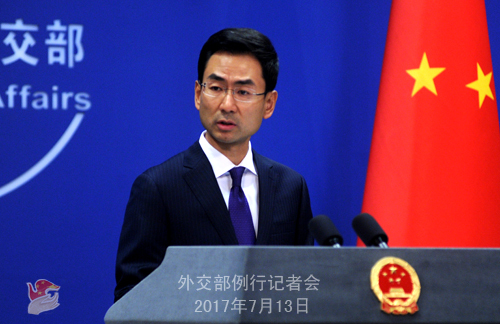 A: I have stated China's principled position yesterday. Today, I should emphasize again that, we agree with the Philippines' statement which stressed territorial dispute should be resolved in the spirit of good neighborliness. At the same time, we also applaud and support the Philippines in upholding an independent diplomatic policy. For over one year, the China-Philippines relations have taken an upturn. The two sides have come back to the right track of settlement through dialogue, consultation and negotiation, established the China-Philippines bilateral consultation mechanism on the South China Sea issue, and successfully held the first meeting of such mechanism in May. With the concerted efforts of China, the Philippines and other ASEAN countries, the situation in the South China Sea has stabilized and taken on a good trend, and the framework of the COC is also concluded. These positive developments conform to the common interests of the two countries and peoples as well as the shared aspiration of regional countries, which marks an irresistible trend. While firmly upholding its territorial sovereignty and maritime rights and interests in the South China Sea, China has also been committed to peacefully resolving the relevant disputes through negotiation and consultation with countries directly concerned, the Philippines included, and working with the ASEAN countries to jointly uphold peace and stability in the South China Sea. China stands ready to continuously work with the Philippines to properly solve the South China Sea-related issues through dialogue and negotiation, and further create sound atmosphere for the development of China-Philippines relations and relevant cooperation. 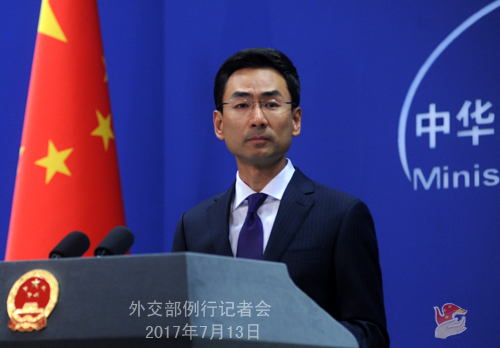 Q: We have noted that China's trade with the DPRK has increased by around 10.5% in the first half of this year. Is China fully enforcing the UN sanctions against the DPRK? And does this figure show that it should be doing more? A: This morning, the Information Office of the State Council held a news briefing, during which the Spokesperson of General Administration of Customs gave a briefing on the trade between China and the DPRK and detailed relevant specific figures. I would like to reiterate that China has been implementing the Security Council's resolutions in a comprehensive, accurate, faithful and strict manner. But make no mistake, the Security Council's sanctions on the DPRK cannot be equated with all-encompassing economic sanctions. The maintenance of normal economic and trade exchanges between China and the DPRK does not violate Security Council's resolutions. Q: I have an historical question relating to the Cairo Declaration jointly issued by China, the US and the UK in 1943. This Declaration is not going to be included in the curriculum guidelines for social studies of senior high schools in Taiwan in the future. There is a view that this is an attempt by the Taiwanese side to advance the so-called "uncertain status of Taiwan" theory. Does the mainland think the Cairo Declaration is legally binding under the international law? Is this historical document still relevant? I know that the Taiwan Affairs Office of the State Council had responded to this yesterday, but I wonder whether the Foreign Ministry has anything more to say? 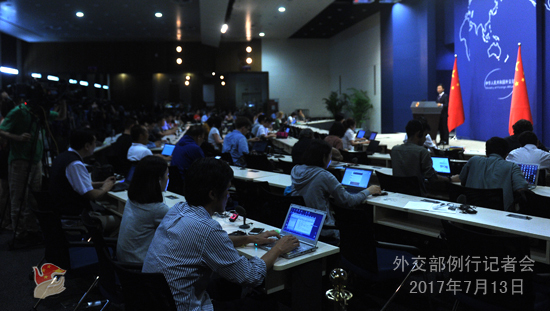 A: It is true that the Taiwan Affairs Office of the State Council has made remarks on this. But since you have asked about the legal status of the Cairo Declaration, I will reply to your question. Taiwan is an indispensable part of China's territory, and China's sovereignty and territorial integrity brook no division. The Cairo Declaration has set crucial international legal basis for China to regain Taiwan and its affiliated islands seized and stolen by the Japanese militarism after World War II. It is an important document universally recognized as part of international law and a major outcome of the world anti-fascist war, which laid down the key foundation of after-war international order for the international community and is of far-reaching historical significance and highly relevant. Q: You mentioned the historical and practical significance of the Cairo Declaration, but another spokesperson of the foreign ministry once said that the Sino-British Joint Declaration is a historical document, but has no practical significance. What are the differences between these two documents? Why do you come up with different interpretations? A: My colleague has stated our stance on the Sino-British Joint Declaration, so I am not going to repeat that. I shall stress that the Sino-British Joint Declaration signed by China and the UK in 1984 has resolved the Hong Kong issue left over by history. Since the return of Hong Kong two decades ago, the Chinese government has administered and governed Hong Kong in accordance with the constitution and the Basic Law of the Hong Kong Special Administrative Region. The guidelines of "one country, two systems", "Hong Kong people administering Hong Kong" and a high degree of autonomy have been implemented faithfully. Hong Kong has maintained stability and prosperity, and its economy developed steadily, democratic political system made steady progress and various programs scaled new heights. All these achievements have been recognized by the whole world. From the date of July 1, 1997, Hong Kong's affairs have become China's internal affairs, and foreign countries have no rights to interfere. The so-called "responsibility" by the UK over Hong Kong does not exist. As for your question about the differences between the Sino-British Joint Declaration and the Cairo Declaration, I believe these two documents are totally different in nature.